Aug 13, 2015 - Columbia Sportswear, Do you want to Earn $30 for? 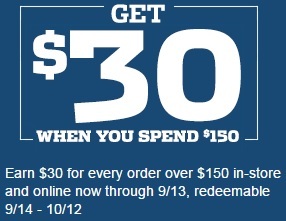 Get $30 when you spend $150 or more at Columbia Sportswear stores in the U.S. or make online order for $150 or more. Offer is valid through 09/13/2015. Redeemable 09/14/2015 - 10/12/2015. Source of the information is Columbia Sportswear. More information available at stores or online.